An anthology which draws on the best writing from across the political spectrum, charting the violence, chaos and corruption that the war on drugs has spawned. 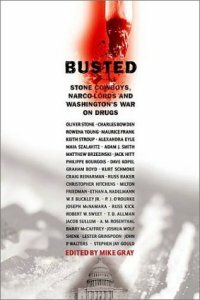 Edited and introduced by Mike Gray, one of America's leading voices for drug policy reform, Busted includes Oliver Stone's jailhouse interview with the deposed leader of Panama, General Manuel Noriega, and Milton Friedman's declaration that there is "no justice in the war on drugs." The effect of US policy south of the border is explored in T.D. Allman's report on the "blowback" from American policy in Colombia and Charles Bowden's insights into the life and death of a DEA informant. Maia Szalavitz and Maurice Frank offer alternative policies for treating addicts, while Ethan Nadelmann proposes a "common-sense drug policy." Joshua Wolf Shenk explores the dislocation between America's relationship with legal and illegal drugs, Russ Baker describes how the philanthropist George Soros defied drug orthodoxy, and Lester Grinspoon makes the case for medical marijuana. With articles by Christopher Hitchens, P.J. O'Rourke, Philippe Bourgois, Dave Kopel, William Buckley Jr., Joseph McNamara, Robert W. Sweet and Stephen Jay Gould, among others, Busted is a compelling and comprehensive survey of America's unwinnable war.